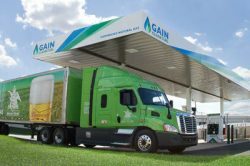 U.S. Gain, which owns the brand GAIN Clean Fuel, has set up two deals to advance the provision of renewable natural gas (RNG) in two states of the USA. The company is working to expand supply of RNG while also seeking opportunities to grow its 50+ fueling station network through both public and private station builds. A new renewable natural gas (RNG) development project is located in Springfield, Nebraska, which is producing much-needed clean fuel for the transportation industry, and a supply contract for Southern California Gas Company’s (SoCalGas) will ensure availability of RNG for their natural gas fueling station network. Both projects will be impactful in the development and supply of RNG across the country. 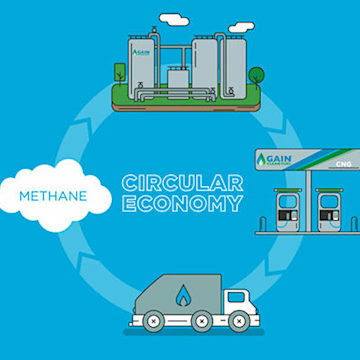 RNG is methane captured from landfill, wastewater treatment plant and agricultural waste that is cleaned and conditioned to meet natural gas pipeline quality standards. Once the gas is certified for use, it can be dispensed through natural gas fueling stations as a drop-in fuel, with no changes to fueling equipment or vehicles. RNG, when used as an alternative fuel, is known to many as the fastest, cleanest pathway to necessary transportation-related emission reductions. It further features proven vehicle technology across vehicle classes and an extensive, developed fueling infrastructure. With more than 70 million tons of organic waste produced in the United States each year, much of which is not being converted to fuel or energy, there are significant opportunities for RNG development still available. As a vertically-integrated RNG provider, U.S. Gain is working with producers and developers on a multitude of landfill, agricultural and wastewater treatment RNG development projects – converting their waste to financially rewarding, clean fuel. One of the most recent projects that U.S. Gain was involved in is the located in Springfield, Nebraska. This landfill will produce enough RNG to fuel 117 class eight trucks daily, the equivalent of displacing more than 2.3 million gallons of diesel. California is vocal about their plans to address the state’s air quality problem. With looming air quality deadlines, key stakeholders across industry sectors have been collaborating to create feasible options that will reduce their environmental footprint and remain compliant with goals put forth by California lawmakers. SoCalGas made national headlines recently by pledging to be the cleanest natural gas utility in North America. A household name in California, SoCalGas plans to deploy a variety of tactics to achieve their vision, one of which is to replace compressed natural gas (CNG) with RNG across their fueling station network. RNG offered at these stations is expected to reduce greenhouse gas (GHG) emissions by more than 21,000 metric tons annually—the equivalent of taking 4,500 passenger cars off the road. Bryan Nudelbacher, director of business development for U.S. Gain, says that providing RNG throughout the SoCalGas fueling network will substantially improve air quality for residents in Southern California.